EL-ARISH, Egypt (AP) — An Israeli drone strike killed five suspected Islamic militants and destroyed a rocket launcher in Egypt's largely lawless Sinai Peninsula on Friday, two senior Egyptian security officials said, describing a rare Israeli operation carried out in its Arab neighbor's territory. The attack came a day after Israel briefly closed its airport in the Red Sea resort of Eilat, close to the Sinai, in response to unspecified security warnings. Eilat was previously targeted by rocket fire from the Sinai. Israel maintained official silence about the strike, suggesting that if the Jewish state was involved, it might be trying to avoid embarrassing the Egyptian military. An Egyptian military spokesman later denied the report but did not provide another cause for the explosion. Egypt's official MENA news agency said an explosion destroyed a rocket launcher set up near the border to launch attacks against Israel, and at least five Islamic militants were killed. But it did not elaborate. Bodies of the slain militants were charred from the blast, an Egyptian official said. He said four of the dead appeared to belong to a family called el-Menaie whose members are wanted for several terrorism-related charges. "Next to the bodies, there were rockets and a motorcycle that turned into pieces," the official said. He spoke on condition of anonymity as he wasn't authorized to speak to journalists. A tribal leader in the area said that an Egyptian helicopter flew over the site a few minutes after the drone strike. 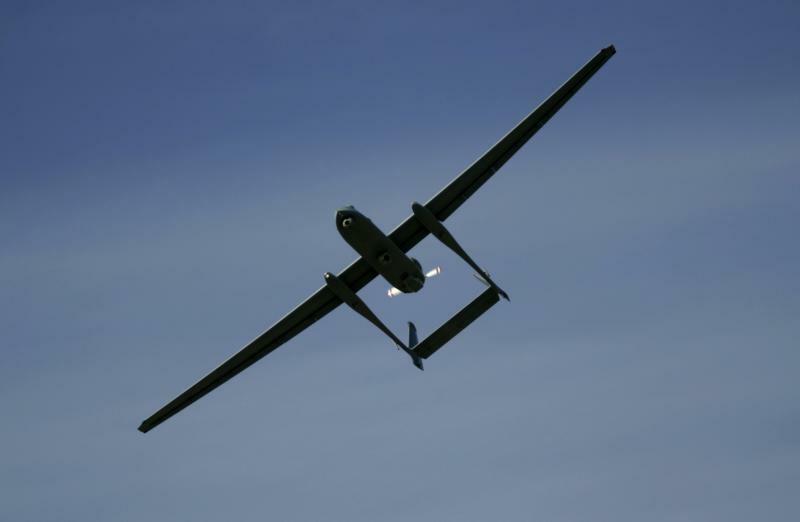 The Egyptian security officials told The Associated Press that the drone had been flying near the site of the attack since early Friday on the Israeli side of the border and fired from there. Those on the Egyptian side of the border could hear the drone buzzing overhead for hours, they said. The site of the strike sits some five kilometers (three miles) from the Israeli border. An Israeli drone attack in the Sinai could signal a significant new level of security cooperation between the two former foes following a military coup that ousted Egypt's president, Mohammed Morsi, last month. The military has alleged that Morsi and his Muslim Brotherhood movement had turned a blind eye to Islamic militants in the Sinai. Meanwhile, Morsi's ouster, which came after mass protests demanding he step down, has triggered a rise in attacks against security forces on the peninsula, raising fears that extremists could exploit Islamist anger to spread their insurgency. The Egyptian security officials, who spoke on condition of anonymity because they were not authorized to release the information, said the Israeli attack was launched in cooperation with Egyptian authorities despite past insistence that the government would not allow anyone to use its territories to launch attacks against jihadi groups. Israel has increased surveillance along the Egyptian border over the past two years, and is building a barrier along the 230-kilometer (150-mile) frontier to keep out militants and African migrants. The Israeli military said only that it was looking into the report after being contacted by the AP. Egyptian military spokesman Col. Ahmed Mohammed Ali initially said on his official Facebook page that security forces were investigating two explosions in el-Agra. He later issued a statement denying "in form and substance any attacks from the Israeli side inside Egyptian territories" and saying the claim of cooperation was "baseless." Egypt's military and security forces have long been engaged in a battle against Islamic militants in the northern half of the peninsula. Militants and tribesmen also have been engaged in smuggling and other criminal activity in the area for years. Under Morsi, Egypt's military tried to launch a major military operation in the Sinai after suspected Islamic militants carried out a surprise ambush of Egyptian troops on the border with Israel and Gaza on last year, killing 16 soldiers. The militants drove into Israel in an apparent attempt to launch an attack there, though they were killed by Israeli airstrikes. After the ambush, thousands of Egyptian troops backed by tanks and heavy equipment deployed to northern Sinai near the Israeli border. But not long, Egypt started to withdraw its forces — which were barred under its peace treaty with Israel. No reason was given at the time, though after Morsi's ouster, several military officials said Morsi wanted to use former jihadis to negotiate for peace with those in Sinai. Amid the political turmoil facing the nation in the more than two years since longtime autocratic leader Hosni Mubarak was ousted, Egypt has adhered to a 1979 peace deal with Israel. But militants have fired rockets toward Eilat, a major destination for domestic and international tourists on Israel's southern tip. Israel briefly closed its airport there on Thursday, citing unspecified security concerns. An Egyptian security official told the AP that officials warned Israel about the possibility of rocket strikes. The official said Egyptian authorities received intelligence suggesting terrorist groups planned to fire missiles Friday at Israel, as well as at locations in northern Sinai and the Suez Canal. Associated Press writer Mamdouh Thabit in Assuit, Egypt, contributed to this report.